Trinity P3: Is Media Transparency desirable only until it costs advertisers money? 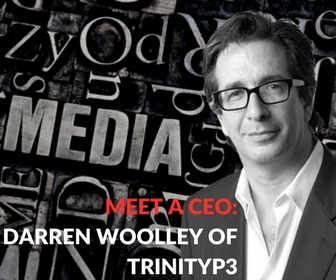 Global Ceo of TrinityP3, Darren Woolley about the quickly growing digital space, and the importance of marketing mirroring strategy. The Big Smoke: Hi, Darren. Can you first of all tell us a bit about your background and how you came to lead TrinityP3? Darren: I graduated from university with a degree in Applied Sciences and worked in the field of Medical Research for five years before embarking on a 15-year career in advertising. In 2000 I founded TrinityP3 marketing management consultants. As Global CEO, I lead marketing consultants around the world through all phases of the marketing optimisation process to improve the performance of our clients’ marketing. What do you think are the biggest barriers marketers face when trying to understand the digital space? I think marketers need to understand that digital is simply another opportunity to be considered in the overall marketing strategy of a business. It is an effective channel that shouldn’t be viewed as being separate, but rather as a part of a system of ways to approach and engage with potential customers. Digital, in the form of paid, owned or earned media, advertising evolution, or data and technology, is now threaded through everything that a marketer touches, yet legacy-based structures place “digital” into silos. This forms a huge barrier against the development of fully integrated marketing strategies. In addition, the requirement for multi-disciplinary teams to be involved in areas of the digital marketing space can prove challenging. Implementing a digital technology stack, to take just one example, requires not just CMO endorsement and compliance, but endorsement and compliance of the CIO, CCO, Research and Insights, and often the CFO. The same can be said for other areas such as web-based asset development, social media strategy, CRM and integrated customer journey mapping. This year, Facebook has finally agreed to an independent metrics audit and Marc Pritchard called for all publishers to comply with MRC-accredited third party verification. What impact do you think that will have on Australian media agencies? The digital media/publishing industry is in many ways an adolescent in business terms, but I think the introduction of these independent metrics will see a major shift in transparency and accountability, which will force the market to mature very rapidly. Agencies and advertisers will need to reconsider their overall strategies for engagement with their audiences and the most effective of these will be the ones who provide a solid mix of media to increase marketing performance. Rather than rating performance on the maximum number of eyeballs reached, or on the cheapest cost of reaching those eyeballs, businesses will realise that as always it’s about targeting the right eyeballs through their strategies that lead to growth. As TrinityP3 is a global operation, what is the biggest difference in regards to expectations from brands when measuring the ROI from their campaigns? In my experience there is a distinct lack of brands that do measure the ROI, or ROMI (Return on Marketing or Media Investment) from their marketing strategies. Brands tend to measure their media performance on CPM (Cost Per Thousand) or the number of “likes”obtained on their Facebook page or posts, but they are failing to close the loop in finding out what their ROMI actually is. Whilst some agency holding companies have now developed more stringent guidelines around other metrics such as viewability, this does not always translate into what is deemed important to measure from the advertiser’s perspective – and, of course, independent verification such as we’ve discussed with Facebook has also been a big challenge. I see this across many of the markets we work in; in fact, it’s often not so much about the market as it is about the type or category of advertiser; naturally, the brands or categories that have grown up in what we could call the digital era, possess a distinct advantage in both their organisational ability and their willingness to measure ROMI. On the flip side, I do see a positive trend to a zero-based budgeting (ZBB) approach for marketing, acknowledging marketing is a growth investment that should ideally provide real ROI for the brand and the business. “You can’t cut your way to growth”, and this focus on investment and marketing performance and ROMI is proof of this. What do you wish brands would focus on the most when measuring the impact of a campaign? I constantly see organisations operating their marketing in a very fragmented way, with marketing functions operating across separate promotions, advertising, distribution, pricing, product and service development, customer analytics, digital departments and the like. But in fact these are all integral “cogs in wheel” that need to be aligned throughout an organisation and should ideally be working together in a co-ordinated approach towards delivery growth for the business. Marketing done well is a powerful discipline for driving growth and should be considered and implemented from an organisational perspective for driving both growth and ROI and not weakened through fragmentation of effort. This cannot be achieved where marketing is considered by the C-Suite as a cost centre, or worse, as the traditional “colouring in department” with no significant performance-driven connection to other parts of its business. Thinking about 2017, what do you think will be the biggest trends for brands to try in their marketing strategies? In 2017 I predict we’ll see a huge shift in brand management from being viewed as a primarily communications function to customer experience movement management, essential for delivering disruptive growth. What is your primary focus in terms of how TrinityP3 serves its clients? TrinityP3 is dedicated to optimising the performance of our clients’ marketing. We do this by focusing on every aspect of marketing, including areas such as organisational structure, operational process, the alignment and output of agencies and other suppliers, cost efficacy, the transparency of the media investment, and the strength of resource investment. This includes all the fundamentals from the ground up. No two projects are ever quite the same; we tailor our approach to specific client needs and apply our significant proprietary IP, experience and intellect to drive actionable recommendations. What is the one thing you wish clients would understand about TrinityP3 when first connecting with you? Having been operating in Australia for the past 17 years, in Singapore for 7 years, being newly established in the UK and preparing to launch in New York, I’ve been able to gain a worldview of the market we’re operating in and Trinity P3 is continually adapting to reflect current and projected changes within the industry. I do however notice that in Australia we are known primarily as “pitch consultants”. Whilst pitch consultancy is one service we offer, it actually represents a relatively small part of our business, in revenue terms. To define TrinityP3 as “pitch consultants” is basically a view that is ten years out of date! The fact is that we have evolved dramatically in the last ten years, and today provide a far more strategic approach for our clients, across many disciplines. How do you manage your own schedule? Do you have any daily rituals? I definitely try to ensure that I take time to work on the business, as opposed to just working in the business. I’m constantly making the time to get out and methodically and objectively review the market, and you can’t do that if you’re only working within the company. As Trinity P3 is a global business, I tend to find myself starting work around 6am and finishing late, so I do try to carve out time for myself, and am conscious of being more flexible with that time. When I relax I like to read, and spend time with my partner as we are expecting twins very soon, so I have definitely worked at creating more flexibility for them. What would be your main piece of advice for aspiring CEOs and founders, especially in regards to their marketing? My advice is to view marketing as a growth opportunity. Whatever your business strategy may be, make absolutely certain your marketing is aligned with that strategy. Instead of viewing marketing as something you might have to consider, understand that marketing is pivotal to your success as a business and make sure you measure its effectiveness in tangible terms like the conversion from leads to actual ROI. A real example of the effectiveness of this approach comes from TrinityP3, where we have seen a 7,000% increase in customer engagement with our website, from 3K to 200K unique visitors, with an increase in time spent, and in conversion of leads and bottom line return on investment. Never, ever allow your marketing to be merely “tacked on” at the end. Founder and Global CEO, TrinityP3 Marketing. With his background as analytical scientist and creative problem solver, Darren brings unique insights and learnings to the marketing process. He is considered a global thought leader on agency remuneration, search and selection and relationship optimisation.